Art connoisseurs have reasons to rejoice! Giclee reproductions of Hawaii Art, Hawaiian Paintings, Classic Hawaiian Photography & Prints from Hawaii’s Golden Age are all available online. Brace yourself for a delightful Hawaiian art experience! ‘Classic Hawaiiana’ is the single destination for Hawaii paintings, prints and photographs. A line of exotic Fine Art Giclee reproductions of Hawaii artworks, Classic Hawaiiana has carved an enviable niche for itself. Classic Hawaiiana offers an exotic selection of black & white prints, color prints and sepia tone prints as well. Classic moments in the Hawaiian history have been beautifully captured and are available for sale online. Vintage photographs featuring eminent people and places are displayed on the website. Books and collectibles are also available for sale. ‘Classic Hawaiian art’ aficionados ought to consider stocking up artistic prints and paintings. Classic Hawaiiana needed a visually attractive website that would leave a striking impression on art lovers. The website had to be user-friendly to ensure hassle-free navigation of Hawaiian artworks. 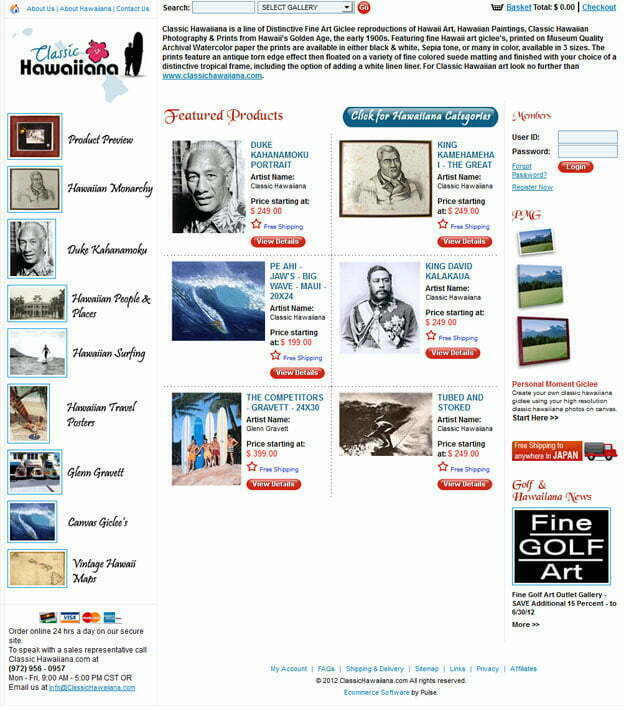 The website needed to be designed in a way that would enable easy and speedy selection of Hawaiian prints, paintings, photographs and Hawaiian memorabilia. Pulse Solutions has earned the reputation for building custom business automation softwares and SEO-friendly websites. We used .net and Ecommerce to cater to the exact designing needs of Classic Hawaiiana. The overall look and feel of the website is welcoming. In fact, the design portrays the true essence of Classic Hawaiiana. The Pulse Design Team is well-versed with the latest developments in web designing. Competent designers tap into their creative streak to craft visually appealing search engine friendly websites.